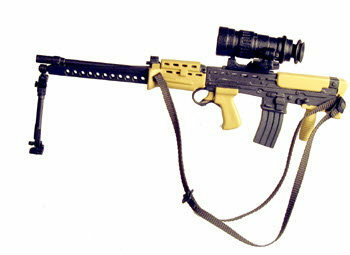 British L86A1 With IFR night scope [MG-522] - $38.50 : Metalcraft by Blair - military gifts and memoribilia. We are presenting a series of miniature guns for your shopping convience. These are accurate 1/6 scale,on average about 4" to 7" in length and are made of plastic or metal, depending upon the mfg. To see how they will look when mounted on a base you need to go to the ( MOUNTED DISPLAYS SECTION ) and see the samples provided. At this time you can mix and match the gun with the base of your choice or any other style presentation.. This product was added to our catalog on Friday 17 March, 2006.